It will be a battle of equals when Delhi Capitals host Mumbai Indians in their Indian Premier League encounter at the Feroze Shah Kotla stadium on Thursday.Both teams are coming into the game having registered convincing wins in their previous encounters and are also seated at 10 points each on the table. 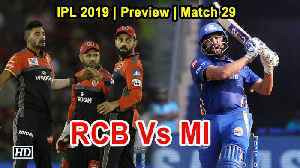 Sunrisers Hyderabad are set to clash with Delhi Capitals in the 30th Match of IPL 2019 at Hyderabad’s Rajiv Gandhi Stadium on Sunday. 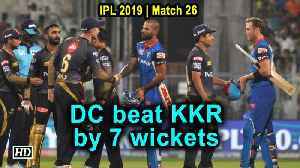 Coming in to bat with the score reading 2/56 in the eighth over, Mumbai Indians' acting skipper Kieron Pollard played one of his best knocks in the Indian Premier League as MI chased down Kings XI..